The Musahar are considered one of the lowest of the Dalit groups within India and suffer tremendously from their status in society. Their name is derived from two words meaning "rat catcher" and is likely attributed to them for their tendency to eat rodents in times of dire need. They are short in stature with a long narrow headshape and broad nasal features. Numbering two million in mostly in the states of Bihar and Uttar Pradesh they have large families and live with several generations in the same household. A Musahar village is almost always filled with children. Though they will frequently speak Hindi, the local trade language, they will speak Angika or Awadhi at home. Land ownership is rare and most will work as agricultural laborers, day laborers or forest and fishing. The women also work in agriculture or other unskilled labor such as stitching leaf-plates. Education is not valued and literacy is extremely low with literacy rates running 2-6%. Often times they will drop out at the primary level due to social or economic factors. Modern development programs have had little impact on them as few if any of the sparse allocated resources designated for them every reach them in their need. Many times their wages are paid in crops and they trade in the market place through barter. Traditionally they follow their tribal faith and will worship their family deity, the village deity as well as the gods of the wider Hindu faith. Due their extreme poverty they live far from towns and cities which have proper health care. Nor do they have the capacity to travel to avail themselves of these facilities. The result is a desperate health care situation. Child mortality and maternal mortality are high and the life span is short which is exasperated by high rates of alcoholism among the male population. Much of their condition is a result of their low position in the caste hierarchy. They are considered untouchables and treated with disdain by all other sections of society. Any attempts at economic advancement will be taken away from them or destroyed and they have little or no capacity to retain property rights. Their constitutional rights of education and food subsidies are routinely denied through corruption and caste based policies. They are powerless and voiceless, unable to change their situation alone. Sadly many Musahar women are kidnapped or sold into prostitution in the major metropolitan cities. Without recourse this becomes their new life, oppressed, abused and forced to suffer in silence. 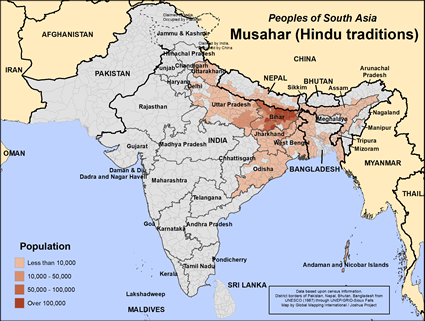 View Musahar (Hindu traditions) in all countries.